Overview: In his play The Tempest, William Shakespeare wrote, “Misery acquaints a man with strange bedfellows.” That easily describes the situation for the members of the Losers – a group of soldiers that have lost their original units. These orphans come together in a special unit that gets assigned the missions that no one else in their right mind would ever volunteer for. 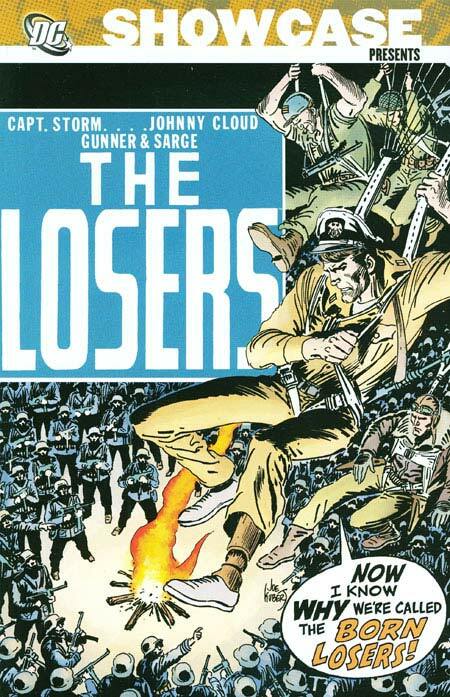 The Losers consist of four soldiers, all previously featured in their own stories by writer Robert Kanigher for the various DC war titles. Captain Storm is the former commander of a PT boat, which was destroyed in battle and the crew lost. Storm lost his lower left leg in an earlier battle and uses a wooden leg to get around. Johnny Cloud, a Navajo pilot who is the sole survivor of his squadron and appears to always fly the final flight of any plane. Gunner and Sarge, a two-man team from the trenches who always appear to be the last two standing from any firefight. The four men, originally brought together by the Haunted Tank, primarily take on missions in Europe. However, getting assigned missions in the Pacific and Africa is not out of the picture. The Losers are given assignments, and each man goes into the battle thinking that this will be their final mission. When they survive the mission, they realize that the Losers find a way to fight again another day. As the title develops under Kanigher and artists Ross Andru and John Severin, the story starts to become an ongoing narrative from issue to issue. On one mission, it appears that Captain Storm is killed in a bomb explosion. He is soon replaced by Ona Tomsen, a female member of the Norwegian Resistance Unit who views herself as a loser, being the sole survivor of her village. Thankfully Storm returns to the team, after a brief foray as a pirate, thanks to amnesia from the explosion. Why should these stories be Showcased? : The concept of the Losers is perhaps more important than the specific characters themselves. The concept (and the characters) are revisited quite frequently over the years, whether it is continuing their original story or assigning the concept to a new group of characters, as seen in the 2002 Vertigo series. The stories are just long enough to tell a decent tale, without getting caught up in repeating the same story formula issue after issue. If you like this volume, try: Jack Kirby’s take on the Losers. Kanigher and Severin’s run with the Losers came to an end with Our Fighting Forces #150. Beginning with the next issue, Kirby did a 12-issue run with Captain Storm, Johnny Cloud, Sarge, and Gunner. Like so many other Kirby books in that era, the initial reaction appears to be less than positive, with long-time readers not appreciating Kirby’s approach. Over the years, fans have flocked back to this run as one of Kirby’s last great DC arcs. The entire run was reprinted in 2009 has a hardcover edition. Overview: “Have time sphere, will travel” appears to be the motto for one Rip Hunter. Surrounded by his partner Jeff Smith and their friends Bonnie Baxter and her younger brother Corky, Rip takes his time sphere primarily into the past, whether it’s a 1,000 years or a 1,000,000 years, to answer the unknown questions that puzzle modern researchers. Each story follows a basic formula — Rip Hunter is given a reason to travel into the past to solve a mystery. Grabbing speech conversion discs that they wear to be able to communicate with anyone they encounter, Rip and his team travel in the time sphere to the time in question. Rip and one of the team – sometimes Jeff, sometimes Corky, occasionally Bonnie – set off to investigate while the other team members try to keep the time sphere hidden. In most cases, Rip and his partner gets into trouble, and have to call on their teammates to rescue them. Along the way, the solve the mystery and return back to the 1950s without ever altering the time line. The best part of this title is the variety of artists that worked on this series. Whether it’s the likes of Mike Sekowsky; Ross Andru and Mike Esposito; Nick Cardy, Alex Toth, or Joe Kubert, there is so much talent in this book that really stands out in the black and white format. Why should these stories be Showcased? : I like the concept of Rip Hunter and his time sphere. I’m hit and miss on the rest of the supporting cast. But I don’t think it works as a regular comic series. These stories quickly fell into a predictable formula, which probably worked well when you were reading the title every other month. I think Rip Hunter is a great character to bring into a story to provide another character with a way to time travel in their story or title. here are numerous reasons why I should not like this book. I am not a huge fan of Carmine Infantino’s art style. I find the formulaic stories from this era too predictable. This is more a science-fiction book than a super-hero book. With all of that said, I really loved this Showcase. Adam Strange felt alive and full of energy. Gardner Fox builds a new universe of characters, and creates an ongoing continuity with the storyline, with past stories and characters coming back in later stories. Footnotes: Showcase #20 and #21 are also reprinted in Showcase Presents Showcase Vol. 1. If you like this volume, try: the CW’s DC’s Legends of Tomorrow show. 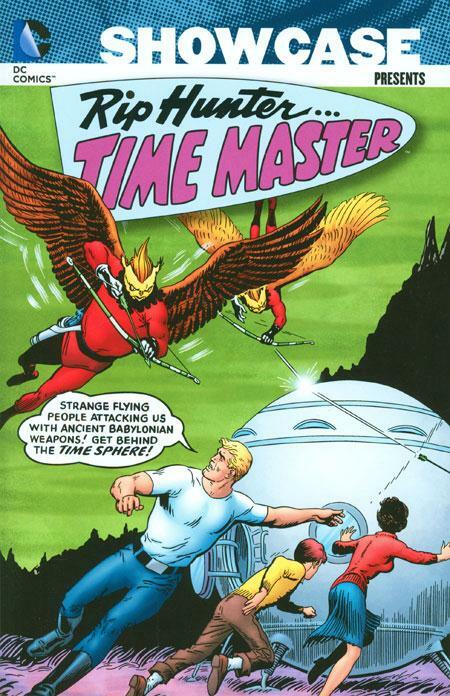 Now airing its second season, Legends of Tomorrow features Time Master Rip Hunter plucking a team of lesser heroes (and villains) to stop the likes of Vandal Savage and Damien Darhk from changing the timeline. The characters were all first introduced on the other CW shows, such as Arrow or The Flash, but probably can’t carry their own show. Arthur Darvill (Doctor Who, Broadchurch) stars as the Time Master captaining the time ship known as the Waverider. This is a fun series that I’ve been able to watch with my family. Overview: DC Comics published 124 Showcase Presents volumes over the last 10+ years. These volumes covered much of the Silver Age and Bronze Age covering all aspects of the DC Universe. If I had to narrow down my reading adventures to just one volume that best represents the potential of DC Comics, it would be this volume, which has a little bit of everything in the collection. This is Showcase Presents The Flash Vol. 4. On the surface, this is a fast-paced (pun intended) superhero comic book. You have a true hero, in and out of the red tights, who fights a never-ending battle against a colorful assortment of costumed villains. But The Flash goes beyond the superhero concept. This is a great science fiction title, as the title hero can travel between dimensions. As always, the stories are filled with science facts, making it a learning tool for the reader. Finally, this may be a stretch, but the romance between Barry and Iris is true and would match up to the stories found in Young Love. This volume contains so many memorable moments that helped shape the DC Universe. We get the wedding of Barry and Iris, which is nearly interrupted by Professor Zoom. We get one of the earliest races between the Flash and Superman, trying to determine who the fastest man alive is. Another Earth is visited, and we finally see a face to go with a familiar name from the credits page. As always, there are some Kid Flash short stories, we get a crossover appearance by Green Lantern, and so much more. Why should these stories be Showcased? : I really like how this title was always moving forward when other titles were happy maintaining the status quo. This volume sees Barry and Iris finally tie the not, and Barry reveals his secret identity to his wife. Over in the Superman books, a Superman-Lois marriage would only be considered as an imaginary story. I do like these stories, even following the shake-up in the mid-1960s when Broome, Fox and Infantino left the title. Newcomer Cary Bates would have a long run with the Flash’s friends and foes. Welcome to Earth-Prime! : The Flash comic helped re-introduce the Justice Society characters as still alive and well, but living in an alternate world designated as Earth-2. In issue #179, we are introduced to a new world that would become known as Earth-Prime. On this world, there are no superheroes. In fact, superheroes are only found in the comic books. The Flash travels to New York City to meet DC Comics Editor Julie Schwartz, who is the one person on this Earth most likely to believe the Flash’s story and help him return to Earth-1. 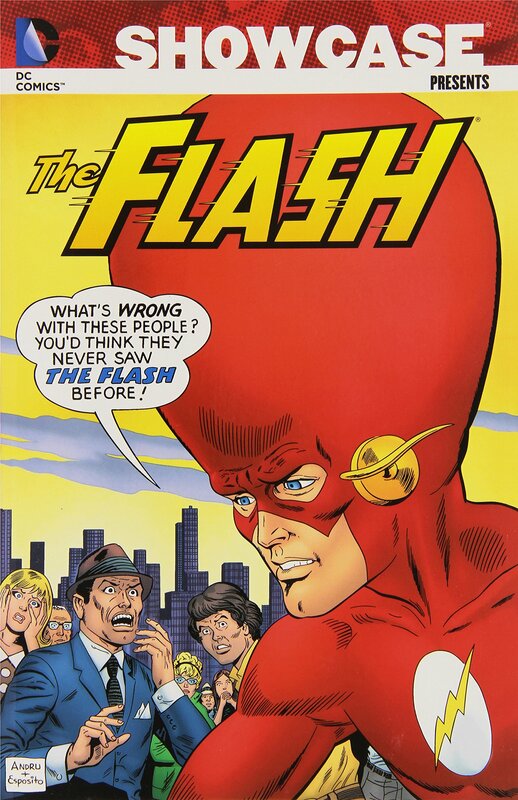 Footnotes: The Flash #169 and #178 are reprint issues. The covers are included in this collection. 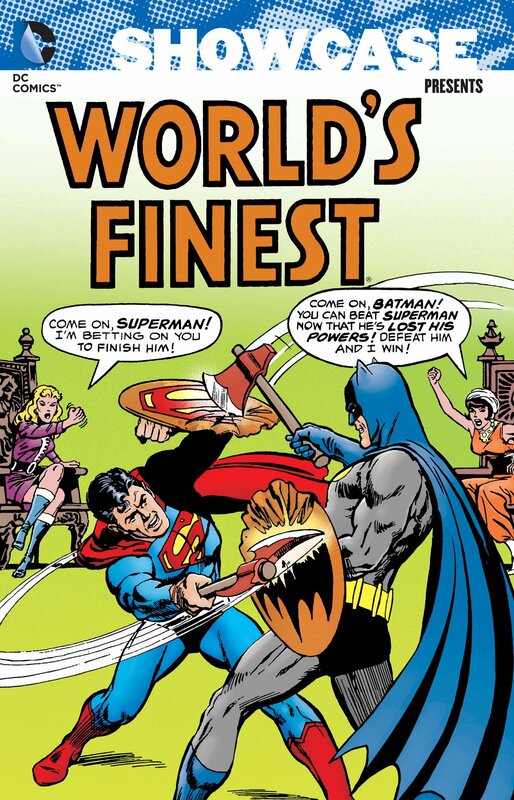 If you like this volume, try: the Superman vs. The Flash trade paperback collection from 2005. DC fans for years had debated over which hero is the fastest man alive, Superman or the Flash. Beginning in 1967, we saw a pair of races in each of the characters’ main titles (Superman #199 and The Flash #175). Neither race was conclusive, so it led to future races across multiple books. This trade collects many of those race stories from the Silver and Bronze Ages. The book sports a spectacular Alex Ross cover. So want to know who is faster? Read this trade and find out for yourself. Overview: With his debut in More Fun Comics #52 (February 1940), the Spectre remains one of DC’s oldest characters. 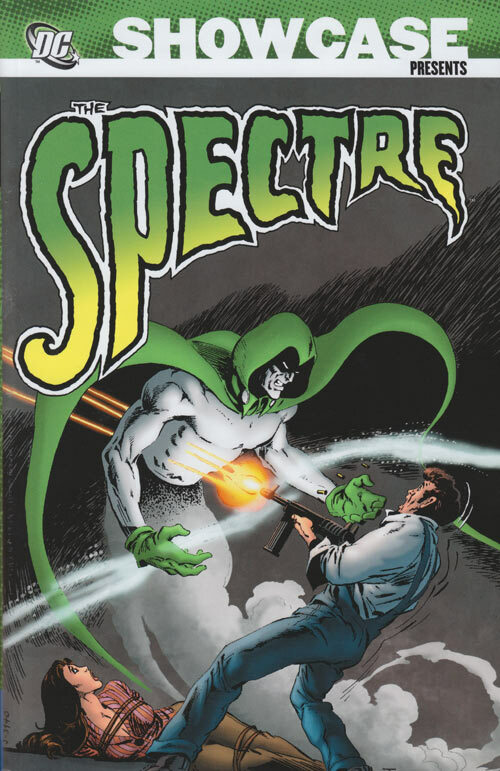 Developed by Superman c0-creator Jerry Siegel (with an attributed assist by artist Bernard Baily), the Spectre was originally Detective Jim Corrigan. The good detective found himself the target of hoodlums, who placed him in a barrel filled with concrete and then drowned. However, Corrigan’s spirit is denied entry to Heaven, and must return to Earth to eliminate evil. During this era, the Spectre would serve as a member of the Justice Society of America. This volume picks up the Spectre’s story in the middle of the Silver Age. The Spectre, along with the rest of the Justice Society, have returned to action in the pages of The Flash and Justice League of America. DC editor Julie Schwartz wanted to see if the Spectre could stand on his own, so he gave the character a try-out in the pages of Showcase, followed soon by appearances in The Brave and the Bold. The interest was there to warrant the Spectre getting his own series, but that only ran for 10 issues. When we see the Spectre again, it is now in the Bronze Age, and the haunted hero is now a feature in Adventure Comics. These stories show the dark potential of the character, as the Spectre exacts brutal punishments to those committing evil acts. This run lasted around a year, before the pages in the book were given over to Aquaman. The volume concludes with multiple other appearances of the Spectre in team-up books and as a backup feature in Ghosts. However, although not collected in this book, our hero could still be found making appearances in Justice League, All-Star Comics, and All-Star Squadron. Why should these stories be Showcased? : This is a mixed volume in terms of the types of stories collected. You get the superhero aspect with the various team-ups, the angel of vengeance in other stories, and would-be horror anthology host in others. So there might be some type of story that you can find in here that you will enjoy. But reading these in consecutive order, the character seems under-utilized most of the time. It’s not until much later, specifically the 1990s, where I feel like a writer and artists finally found the full potential of the character. Earth(-2) Angel, Earth(-1) Angel: So which DC Earth do the Spectre stories take place in? For the stories that involve the Justice Society members such as Wildcat, those take place on Earth-2. For his team-ups with Batman, Superman, and the Flash, those take place on Earth-1. As for the rest, well, I think that is up to the reader to decide. The Spectre seems to not be bound to any one Earth in particular, especially when the story is scripted by Bob Haney. Footnotes: The Brave and the Bold #75 is also reprinted in Showcase Presents The Brave and the Bold: Batman Team-Ups Vol. 1. The Brave and the Bold #116 is also reprinted in Showcase Presents The Brave and the Bold: Batman Team-Ups Vol. 3. DC Comics Presents #29 is also reprinted in Showcase Presents DC Comics Presents: Superman Team-Ups Vol. 2. If you like this volume, try: The Spectre series from 1992. The series ran for five plus years, and it was written entirely by John Ostrander. The series focused on the Spectre serving as the embodiment of the Wrath of God, dealing out punishments for murders of any kind. Ostrander is a former theology student, and his knowledge and experience were reflected in the story topics found over the course of the series. The first 22 issues of the title were recently reprinted in trade paperbacks, but you will need to hit the back issue bins to track down the remainder of the series. Well worth the hunt! Overview: Merciful Minerva! Wonder Woman finally faces off against the one foe she cannot stop. The mightiest foe of all time – the dreaded, all powerful DC Comics Editor. Because the pen is truly mightier than the sword. Welcome to Showcase Presents Wonder Woman Vol. 4. The volume starts off with an Egg Fu story that covers all of issue #157 and part of the #158. But what drives this collection is the second story in issue #158. The crew of the Wonder Woman title (Robert Kanigher, Ross Andru, and Mike Esposito) makes cameos as DC decides to streamline Diana’s supporting cast. Many of the supporting characters, such as Wonder Tot, Mer-Boy, Birdman, the Glop, and others, are cast off into limbo. Wonder Woman, Steve Trevor, and Hippolyta survive, and the editors promise that beginning with the next issue, Wonder Woman would return to her Golden Age beginnings. True to their word, beginning with Wonder Woman #159, we see a retelling of the origins of the Amazons, and how Diana came to be created. We see the challenge of the Amazons, which would determine who would leave the island to go live in Man’s World. We see Col. Steve Trevor crash near Paradise Island, and how Diana nursed him to health before returning him to the United States, where she took over the identity and life of Lt. Diana Prince, a nurse in the army. 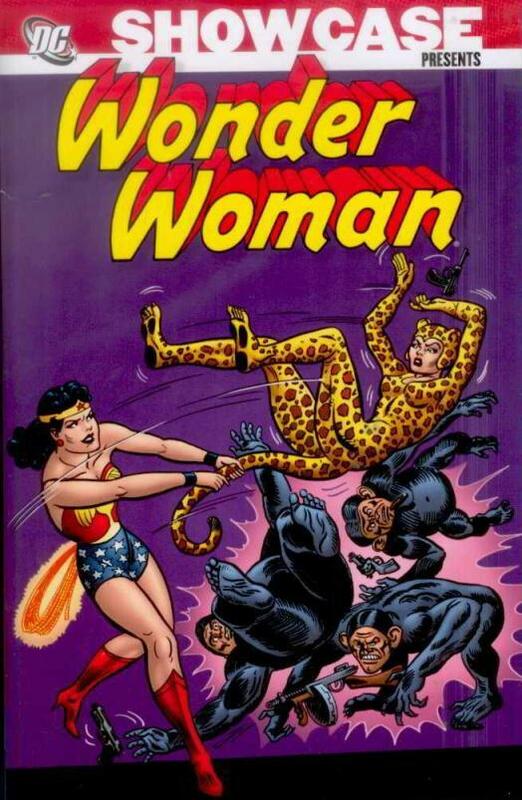 Firmly establishing herself as a hero, Wonder Woman battles the familiar foes such as the Cheetah, Doctor Psycho, and Angle Man – why wasn’t Angle Man sent to limbo?!?!? Towards the end of this volume, less emphasis is made that these are Golden Age stories, but rather they are set in the Silver Age proper. For example, the final issue in this volume, #177, features a team-up between Wonder Woman and Supergirl. That issue teases us with a promise of Wonder Woman going in a new direction in the next issue, but that is a story best saved for a future volume, we hope! Why should these stories be Showcased? : So, of the four Showcase Presents Wonder Woman volumes to date, this is probably the most readable of the bunch. That said, it’s still not a very good collection of stories. Once the DC Editorial hits the giant cosmic reset button in issue #158, the stories become simpler without the convoluted character histories. The stories focus on Wonder Woman and Steve Trevor, with the occasional visit to Paradise Island to see her mother. The caption boxes tell us that these are Golden Age stories being told in the current (Silver) age. We get to see more familiar villains, such as Cheetah, Giganta, and yes, Egg Fu. Diana Prince’s military rank fluctuates from issue to issue between lieutenant and captain, with the occasional issue where she is still a military nurse. Towards the end of this volume, once Ross Andru leaves the book, the stories start to feel more like Silver Age stories, current with other books of that era. I cannot wholeheartedly recommend this book. But if you feel the need to possess one of these Wonder Woman collections, this is the one you should own. If you like this volume, try: the Wonder Woman TV series from the 1970s. For so many people, this version of Wonder Woman was their first encounter and remains the best representation (to date) of everyone’s favorite Amazon. Starring Linda Carter and Lyle Waggoner, the series ran for three seasons. The first season was set in the World War II era of the 1940s, following the earliest adventures of Wonder Woman. For the second and third season, the series was reset to place the characters into the 1970s. (Trying to set a TV show thirty years in the past was getting expensive for this type of show!) Carter’s take on Wonder Woman remains legendary but don’t expect riveting television here. The shows remain campy and are full of plot holes. You don’t have to own these – check out the series on Netflix or some other platform, or check the ME-TV programming guide. It’s worth seeing at least once. Overview: Those wacky robots that could only come out of the Silver Age, the Metal Men, return for more action. Behind the creative genius of Dr. Will Magnus, the Metal Men battle evil robots, travel across space, and protect the Earth from any threats. The issues in this collection follow the same formula as the previous volume, where the team fights the threat of the month. There are some stories that carry over into the next issue, but most of these are one-and-done comics. For a quick recap, the primary team consists of the six robots created by Magnus, each containing a responsometer which helps animate the robots and provides them with a unique personality. Gold, who leads the team in the field. Mercury, who wants to lead the team in the field. Iron, the strong man of the team. Lead, nearly as strong but not as smart. Tin, whose courage is his strength. Tina, who believes a robot can love a human. In addition, the team is joined by another female robot, Nameless, which we saw Tin put together in the last volume. Nameless appears throughout most of the volume, promising that one of the fans will get to name her in the letters column. While some names are given in issue #21, the Nameless name seems to stick. Unfortunately, Nameless disappeared (without explanation) when the book went in a new direction beginning in issue #33. But going back to issue #21 for a minute, this is a quirky but important comic. First, we get cameos from Batman & Robin, Wonder Woman, and the Flash, which helps to firmly establish these heroes as part of the DC Universe. Next, the Metal Men take the initiative and seek out a mission, as Dr. Magnus is indisposed throughout the issue. (He spends 22 pages making out with the romantic interest of the month, much to Tina’s chagrin.) 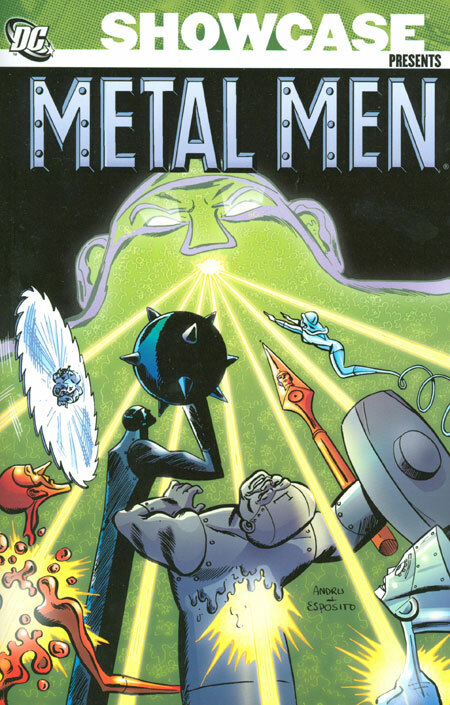 The fact that the Metal Men can act independently comes into play at the end of the book. I’ve made mention twice now about the end of the book. Beginning with issue #33, the title shook things up, whether to increase sales and/or provide a new take on the characters. Mike Sekowsky and George Roussos take over the art duties, while Robert Kanigher continues to script the adventures. The Metal Men find themselves on the run. Dr. Magnus is in a coma and is unable to lead the team. In his place, his brother Col. David Magnus, who works for an unnamed branch of the military, takes over control of the robots. This initial arc ran three issues, which brings us to the end of the collection. Guess I will need to hit the back-issue bins to see how the rest of this story plays out. Why should these stories be Showcased? : I want to like this more. I want to like this as much as I liked Volume 1. But this one just doesn’t match up for me. The stories feel very repetitive after awhile. We have no new characters introduced in this volume. They still just have just the one main arch-enemy in Chemo. The highlights of this volume came with the pair of Gil Kane issues towards the end of the collection. I’m still a fan of the Ross Andru art, and that has always been a good reason for me to pick up a book. But I don’t think you need to go out of your way to include this book in your library. Footnotes: The Brave and the Bold #66 is also reprinted in Showcase Presents Metamorpho Vol. 1. If you like this volume, try: the three-issue story arc in Superman/Batman #34-36 from 2007. Lucius Fox has hired the Metal Men to help protect WayneTech, after a string of attacks. The Metal Men are joined by a new female robot, Copper. Of course, in a title like Superman/Batman, you might expect some Superman foes to show up, which they do with Metallo and then Brainiac. The art in this arc is done by Pat Lee, who was most known for his work on the Transformers comics of the early 2000s. He gives the Metal Men a unique look that matches their various personalities. This was collected in 2016 in Superman/Batman Vol. 3 trade paperback, so it should be easy to track down if you can’t find the original back issues.